Late in August 1814, Bill set up an ambush on the Canadian side of Lake Ontario near Brighton, on the main road between Kingston and Toronto used by military dispatch riders. When the westbound rider came by, he jumped out, pistols in hand. He took the rider's weapons and satchel of dispatches, shot his mount, and sent him home on foot. And then he waited. An hour later, a dispatch rider came from the east. Bill relieved him of his dispatches and sent him home on horseback. When he returned to Sackets Harbor, they discovered many important letters. 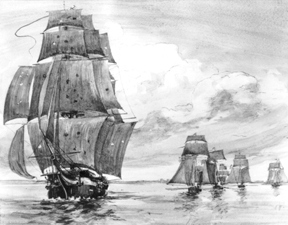 Legend says one satchel contained plans for another raid on Sackets Harbor, and that with their plans revealed, the British canceled the attack.It is not true. The British had discussed attacked the US fleet at that harbor in April, but decided against it. By August, Sackets was too well defended.